It is possible to buy a much cheaper insurance ('TLO') for the hull risk, which covers Total Loss Only. In other words, if the vessel is damaged you must repair it at your own cost; the policy will only respond if the vessel is a total loss (by paying you what it was worth so that you can purchase a new one). Most hull brokers will be able to obtain the best overall cover by blending an H&M policy which excludes total loss with a standalone Total Loss Only policy. The latter policy would find most vessels never making a claim and could therefore be bought relatively cheaply and as the H&M policy excludes the largest risk possible (for loss of the vessel) it too would be comparatively cheap. The rationale from an underwriting side is that both insurers can more accurately identify the risk in what they are underwriting and can therefore be more specific in how much premium they charge. Increased Value - For well known reasons, the Marine Insurance Act only allows you to buy cover for things in which you have an 'insurable interest'. For this reason, H&M insurance is limited to the market value of your vessel. However, it was gradually realised that as a shipowner, if you lose your vessel, you will incur a great deal of costs which exceed the mere cost of buying a new one. Therefore, a new insurance became available, calling 'hull interest' or 'increased value' or 'IV', to provide cover for this. It generally entitles you to a payment of 20% - 25% of the vessel's value in the event the vessel is a total loss. This will be paid in addition to the main H&M settlement for the vessel's value. War & Strikes - Losses related to war and strikes are excluded from normal H&M cover, but you can buy an additional cover which replaces this exclusion (albeit some elements of the exclusion like Nuclear cannot be bought back). K&R - Kidnap and ransom insurance became more popular again in the 2000s, with an upsurge in attacks in Somalia, South East Asia and West Africa. It pays the cost of negotiating release of the crew and / or ship, in the event they are taken by pirates. RDC/FFO - Most H&M policies include only 3/4ths cover for collision risk, and none for FFO (damage to fixed of floating objects) risk. However, today many H&M insurers allow you to add full cover for collision risk or cover for FFO risks to their policy. It is important to ensure your P&I then excludes these risks, in a way which dovetails with your additional H&M cover, as otherwise you will have a Double Insurance position, which will be procedurally and legally problematic in the event of a claim; and you will obviously not be paying premium efficiently if you are paying to insure the same risk twice, but can only claim once. This is a collection of terms that I have built up after being asked by someone what something means or which I have heard people appear to misunderstand. I have endeavoured to explain each in simple terms.For my list of general terms please see my Glossary. AB - Able-Bodied Seaman. A general crewmember onboard a vessel, in good health and with a general knowledge of working onboard a ship. AIS - Automatic Identification System. This is a modern system for identifying ships and their exact locations / movements. Ships have AIS equipment onbaord which transmits information which gives the ships details and GPS coordinates. This information can be used by VTS operators, ports etc. for day to day interaction with the ship and logged by ship tracking systems (Seaweb, Lloyds MIU etc.) for long term records of a ships movements. AOV - Any One Vessel. AUV - Autonomous Underwater Vehicle. This is a subcategory of UUV submersible craft which can function without an operator at all, scanning the seabed using set parameters, for example. AWIWL - Always Within Institute Warranties Limits. CBA - Collective Bargaining Agreement. This is a document which acts as an extension to a group of employment contracts, usually for crewmembers onboard vessels. In general an employer who has a certain number of staff will be approached by a representitive of the employees as a group, who will negotiate terms which will be incorporated into all their agreements. It typically acts to fix compensation for injuries or provision of care for employees who fall ill.
C/M - Crewmember. A common industry shorthand. DO - Diesel Oil. To distinguish from ship's bunkers. ETA - Estimates Time of Arrival. Where followed by a location the time estimated to arrive at that location (e.g. ETA Liverpool 14:00 GMT). FFO - Fixed or Floating Object. This term is used to describe an incident where a ship hits something fixed or floating (but not another vessel, that would be a collision) and causes damage to it; for instance where a ship crushes a wooden pier (fixed) or dents a navigational buoy (floating). You will hear people talk of an 'FFO claim' accordingly. Some insurance policies will use the term 'fixed or moving object', to encompass claims where a ship damages third party property which is neither fixed nor floating (i.e. a delivery truck ashore). IRTC - Internationally Recognised Transit Corridor. This is an area which has been marked out in the Gulf, in order to try to prevent Pirate attacks on vessels off the East-Coast of Africa. Discussions narrowed down the most popular route, furtherst from the cost and with least risk of attack and it is now recommended that all vessels use this when navigating the area for safety. MFV - Motor Fishing Vessel. Most ships powered mainly by engine are referred to as 'MV' so this is just a more specific title where the vessel is used for fishing. OWS - Oily Water Separator. Most commercial ships have bilge wells which collect bilge water; a combination of water drained off from various sources on board which can include water from mechanical leaks and it normally contains oily residues. Bilge water generally needs to be pumped overboard to maintain the ships stability, but in line with international conventions (MARPOL) the oil in the water must be separated before thesis done. This is then normally done by an overboard pipe. PDPR - Per Dar Pro Rata. This normally appears in charterparty wordings against an amount. 'USD 1,000 PDPR' means that if you are referring to 2 hours the relevant amount is USD 83. POEA - Philippines Overseas Employment Administration. An organisation which represents Filipino crewmembers on foreign vessels. They assist mainly with the creation of collective bargaining agreements and providing standard contract terms for employment. RDC - Running Down Clause. An old fashioned term for a a collsion with another vessel is 'running down', and therefore the clause in a marine insurance policy which relates to collision claims is often called the 'Running Down Clause' or 'RDC'. ROB - Remaining on Board. Use in vessel shorthand, for instance, 'bunker spill occurred, ship now grounded and leakage stopped, 10 mt of Bunkers ROB. PAX - Passenger. A commonly industry shorthand, i.e. 'hit by rogue wave, some damage to stern windows, no PAX injuries'. ROV - Remotely Operated Vehicle. This is a description of a category of small machines which are designed to operate underwater without a controller onboard, but being operated by someone onboard a larger vessel on the surface, usually they will use a remote control of some form linked to the unit by electrical cable. It is a subcategory within the UUV group of marine equipment and includes, for instance, robots which can film deep sea wrecks. SITREP - Situation Report. Shorthand for an update provided on a particular situation. TTL - Total. Commonly used in fixture notes for charterparties. TEU - Twenty-foot Equivelant Unit. This is the term for measurement of how many containers a ship can take onboard based on the maximum number of original twenty foot long container units it could carry. Of course sometimes a 40 foot container or other structure may be used in some areas of the ship, so a 10,000 TEU ship may be full laden but carrying a lot less than 10,000 individual containers, so giving the number of TEU it is capable of carrying is a better way of comparing it with other ships. Some people use the words Totally Enclosed Unit instead but it refers to the same thing. UUV - Unmanned Underwater Vehicle. This is a group of small submerged craft, designed to be operated from a surface vessel, but with with no one actually onboard (not including, for instance, mini-submarines). This group of underwater equipment includes ROVs and AUVs. VSL - Vessel - A commonly industry shorthand. VTS - Vessel Traffic Services. This is the term for an organisation which controls vessel traffic in a given area. Usually controlling movement of ships and boats on a busy river or near a port. WP - Generally this means Without Prejudice, which is a short for of saying without prejudice to our rights or position in law (i.e. if someone accuses you of a wrong against them you may feel that you did not commit it or do not know whether it happened but wish to get rid of the problem by offering them some money but you would do so 'WP', i.e. if they didn't accept it you would not want them showing the offer of money to the judge as proof that you did commit the wrong, the offer would be without prejudice, or damage, to, your rights). However, I have also seen this used in c/p's to mean 'Weather Permitting' (i.e. vessel to begin loading WP, 10/10/2012). WWWW - This is a term often found in charterparties. It sets out the conditions when a Notice of Readiness can be tendered, to confirm that a vessel has arrived in port for the purposes of commencement of laytime. As an acronym of four separate acronyms it can be quite confusing. It means WIBON (whether in berth or not), WCCON (whether customs cleared or not), WIFPON (whether in free pratique or not) and WIPON (whether in port or not). Cargo claims are claims for compensation made against a carrier for loss of or damage to cargo which they carried for reward. These claims are usually brought by owners of the cargo, in contract, based on an allaegation that by damaging the cargo whilst in their custody the carrier breached an express or implied term of the contract. Most cargo claims against shipowners are brought not by the owners of damaged cargo but by their insurers. As covered in our 'Cargo Insurance' guide, when a party moves cargo they will normally take out insurance to protect them against its loss or damage. These insurance policies typically state that claims will be paid once the cost of the loss or damage to the cargo is known (i.e. they do not require the cargo owner to pursue any legal recourse against the responsible party first). The reason for this is that most of these policies have a 'subrogation' clause, whcih requires the assured to allow the insurer to pursue a claim against any responsible party where a claim is paid under the policy. The insurance compamny will not have a dircet legal recourse, in contract or tort, against a responsible carrier so any claim they bring would have to be brought in the name of the cargo owner, for which the insurance company would clearly require their permission and cooperation. Subrogated rights can be evidenced on a form of subrogation signed by the cargo owner / insured and addressed to their insurer. These forms are often sent along with claim settlement cheques where the insurer considers that there may be a legal recourse for damage done to property during tranit. Responsibility for cargo loss / damage will generally turn on evidence of causation and terms of the contract. The contract terms will generally be found in the Bill of Lading, Charterparty or other prevailing carriage document and will usually be subject to one of the main international conventions on the carriage of goods by sea (Hague Rules, Hague Visby Rules, Hamburg Rules etc.). Which convention applies will depend on the countries of transit and the proposed law and jurisdiction of the contract. ARTICLE: The Difference Between Admiralty, Marine, Maritime, Shipping Law etc.? Admiralty - Traditionally 'admiralty law' referred only to contractual and tortious disputes arising from the operations of ships (named after the typical work of the Admiralty Court in England). It would not, for instance, cover governmental or international shipping regulations. However, the description has become more loosely used over time and today it is interchangeable with 'Maritime Law' as a term describing all law related to ships. Boating Law - This is a US term, which essentially means the same as 'admiralty law', although it is often used to describe smaller level admiralty law (yacht fees, radio requirements etc.). Carriage of Goods Law - This specifically relates to the law of moving cargo. It is not restricted to marine cargo (unless referred to as 'Carriage of Goods by Sea Law') and will cover goods being moved by sea, road, rail, air and multimodal (by more than one means). Law of the Sea - This is an area of public international law (deals with relationships between countries, rather than private people or companies). It provides rules on sea borders, pollution, ownership of natural resources at sea etc. The United Nations Convention on the Law of the Sea (UNCLOS) provides much of the law in this area. Marine Law - This is perhaps the most broad of the terms and encompasses all law related to the sea or waterways. It would cover international agreements on sea borders, laws on fishing quotas and the law governing transport of goods or the operation of ships (i.e. it is a catch-all term for Law of the Sea and Maritime Law). Maritime Law - Describes all law related to ships and shipping; including the building, navigation, crewing, operation and other activities and incidents related to ships. Although now used interchangeably with the term 'Admiralty Law', Maritime Law is preferable as the more common term. Shipping Law - This is perhaps the best term to describe the law relating to ships. Shipping law covers the building and operation of ships and is split into two categories: wet and dry. 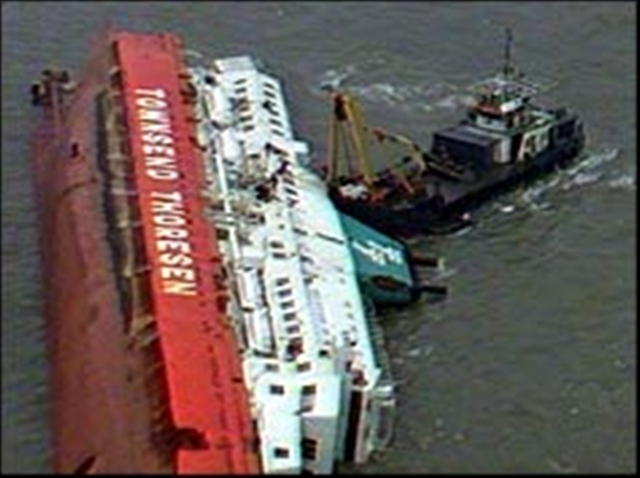 'Wet' shipping law involves things happening on water, like ships sinking, colliding with other ships or objects and other casualties at sea. 'Dry' shipping law refers to things happening on paper like disputes about charterparty clauses or shipbuilding contracts. Many lawyers who deal with wet shipping matters only consider that dry shipping disputes can be boring as they are not linked to any real wolrd event. Trade Law (aka ´International Trade Law´) - This refers to the law of trade between countries and the international conventions governing that trade. It is only loosely related to ships, via international conventions like UNCITRAL (United Nations Convention for International TRAde Law). Transport Law - This is a catch-all term for the laws covering all types of transport, incluing sea, road, rail and air transport. It may proscribe something like that a certain product must be carried by sea, and not by air. In the absence of any grammatical or punctuational emphasis, vessel names would be hard to distinguish in written prose, because they are often named after people ("Mary Rose"), animals ("The Red Fox"), places ("Arendal") or other things ("Time Bandit"). You do not have to put 'the' before a vessel's name, unless it is part of the name itself. For example, if a ship called "Titan" had entered a port, it is better to say ' "Titan" entered the port ', rather than 'The "Titan" entered the port'. This rule can be difficult when vessels are named after certain things. For instance, where a vessel is named "Emperor", it is very tempting to refer to it as ' the "Emperor" ', as you would refer to a real Emperor. But we have to remember that it is a name and not a description or title. Imagine you called your cat Emperor, you would not say 'the Emperor came around the corner', you would just say 'Emperor came around the corner'. The same rule applies. Every vessel either has, or can be given, a prefix to identify the type of ship (a list of the most common is provided below). Generally you should only use the prefix if it has become part of the recognised name, as with "RMS Titanic". It is not necessary to describe a bulk carrier called "Deep Blue" as MV "Deep Blue" to tell people the vessel has a motor. If you are citing a ship prefix there is no need to put a slash or full stops in the prefix (it is well known that they are acronyms) - so RMS rather than R.M.S. and MY rather than M/Y. * Motor Ship and Motor Vessel mean the same thing and either can be applied to the same vessels. ** Titanic seems to have the wrong designation as "RMS Titanic" as it was an ocean liner carrying passengers, but the RMS is correct as at the time it was given the prestigious right to carry Royal Mail to North America. As a result it was able to place RMS before its name and fly the Royal Mail standard whilst underway. On a more mechanical level it was a steam-engine powered ship, so some people still call it "SS Titanic". Vessel: "Herald of the Free Enterprise"
Just after 6pm on 6 March 1987 this Ro/Ro ferry left the port of Zeebrugge headed for Dover. A crewmember had fallen asleep and the crewmember who was supposed to check on him did not. THe ferry had left port with its bow doors open. Just minutes after leaving the port the ship began taking on large amount of water. Within 45 seconds it had sunk, leaving 193 passengers and crew dead. This was the worst disaster on a British ship since the Titanic. * The incident helped bring about the ISM code to attempt to ensure that something similar never happened again. * Not including wartime events. There are many very useful books in the world of Maritime Law, but in each area there is one which can be considered almost a bible for the subject. Bills of Lading (3rd Ed.) by Richard Aikens, Richard Lord and Michael Bools - £ 405. Voyage Charters (3rd Ed.) by Julian Cooke & others. £ 475. Time Charters (6th Ed.) by Terence Coghlin & others - £ 470. P&I Clubs: Law and Practice (4th Ed.) by David Semark - £ 360. The Law of Tug & Tow (2nd Ed.) by Simon Rainey - £ 390. Thomas Stowage (5th Ed.) by Captain G.M. Pepper Master Mariner - £ 100. Ship Knowledge (6th Ed.) by Dokmar - £ 60. 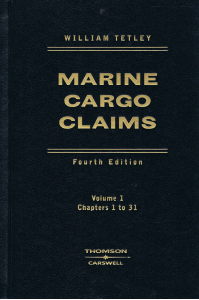 Marine Cargo Claims (4th Ed.') by Prof. William Tetley - £ 220.